The European Southern Observatory’s newest telescope, VISTA (Visible and Infrared Survey Telescope for Astronomy), highlights the distinction between looking and seeing. The telescope’s ability to look in infrared wavelengths is counteracted by astronomers’ inability to see the images as anything but familiar theory. 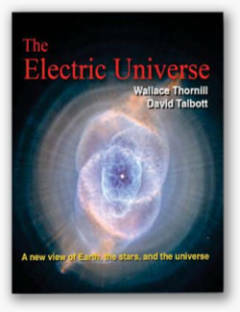 The Electric Universe sees filaments—parallel filaments, twisting filaments, braided filaments, filaments everywhere—a feature that the press release didn’t even notice, much less find “curious.” Of special interest are the evenly spaced coronal “hairs” along and perpendicular to the central column of dusty plasma between the upper and lower “bubbles” or cells of plasma (the “clearings”). These are indications of a high electrical potential between the central discharge channel and the surrounding region. The z-pinch forces of the central current not only constrict it into its columnar form but also pull in surrounding dust, ions, and neutral matter. The increased density is why the region is optically opaque. Pinch instabilities along the secondary filaments of current that make up the columnar current further constrict the plasma into the “curious red features”—the beginnings of electric stars. The plasma “bubbles” at each end of the dusty column are sheath-like enclosures of double layers, similar to the cells of plasma within the “funnels” at each end of the pinches that generate planetary nebulas. Consensus astronomers see a “clearing” because the only mechanism available to them is the pressure from light. Plasma theory has the much stronger and more differentiated mechanisms of electric fields. Compare, for example, the force of light as demonstrated by an electroscope with the force of electromagnetic fields as demonstrated by an electric motor. The form of a column with a bubble at each end will remind those who are familiar with plasma discharge phenomena of the squatter figures in petroglyphs. 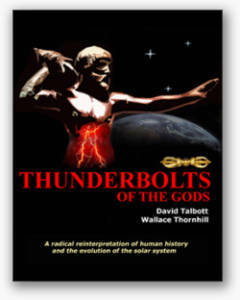 It also shows the characteristic form of the thunderbolt of myth as represented in art and artifacts around the world. The mythical thunderbolt was planet-size and reputedly dropped lumps of stone and iron on the Earth. 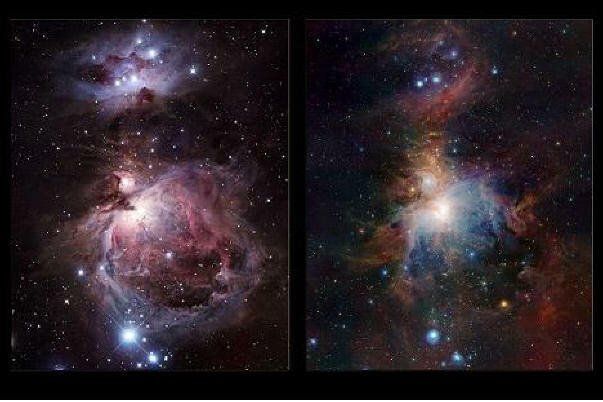 The Orion Nebula is a super-stellar-size thunderbolt that is dropping stars. 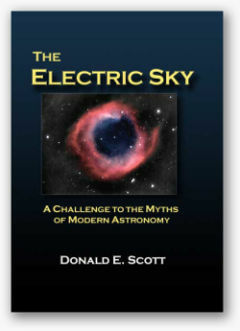 The consensus theory sees in the Orion Nebula meteorological metaphors, theoretical deductions, and obsolete presumptions. The Electric Universe sees in the Orion Nebula the same phenomena that occur in a so-called “gas discharge” tube and that can be tested in a laboratory. The next step for the reader is to decide how he wants to see what he’s looking at.